Posted in: 1 Pageant Pages, 2 Shout-out-Looks. Tagged: 65th Miss Universe, Catalina Cáceres, Jamie Herrell, Miss Earth 2014, Miss Universo Chile. You will most likely remember Catalina Paz Cáceres Ríos of Chile during Miss Earth 2014. She was unplaced in that edition won by Jamie Herrell of the Philippines. Now, she will comes back with a transformation more beautiful than the last time she stayed in Manila. As Miss Universo Chile 2016, she is all set to join the 84 other confirmed candidates for the 65th Miss Universe. Catalina is aged 26, stands 5’9″ and works as an Interior Designer. It might interest you to know that aside from her charity work with Alzheimer Chilean Corporation, she is an avid supporter of LGBT rights. During her national finals, she spoke strongly in favor of gay marriage and adoption. Catalina Paz Cáceres Ríos is excited about her 2nd trip to the Philippines, one that is significantly more special because she will banner the participation of Chile in the biggest beauty event of the Universe. Will lady luck stay on her side this time around and see her through a good placement – if not a top victory – in the January 30 finals? Your impressions of Catalina, dear readers? Posted in: 1 Pageant Pages, 2 Shout-out-Looks. 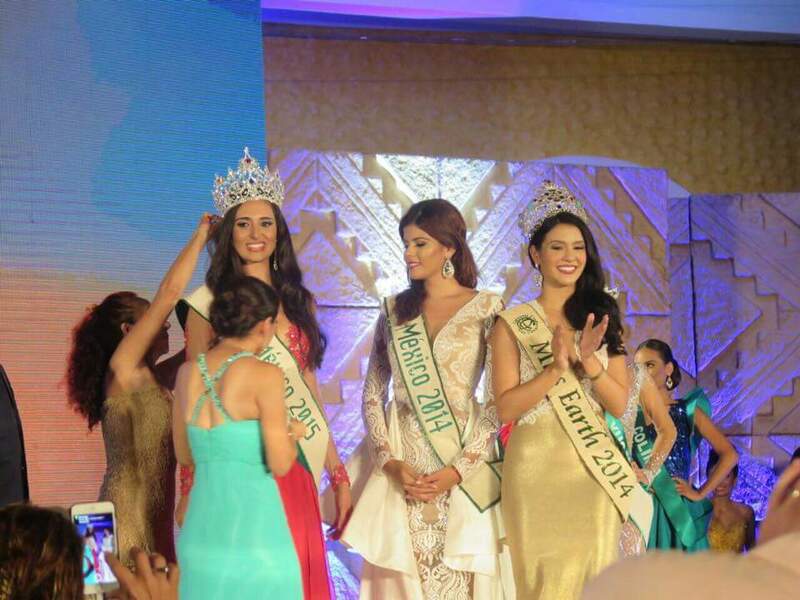 Tagged: Angelia Ong, Jamie Herrell, Miss Earth 2014, Miss Earth 2015. Theirs is a back-to-back victory that had its share of intrigues and comments that reverberated around the pageant world. The very first in Miss Earth history, in fact. And you can’t help but fully agree with the turn of events in Vienna, Austria. Just how can the judges do it any other way if Angelia Ong was most richly deserving of the crown? This is one back-to-back I don’t feel even the smallest feeling of guilt about. She worked hard for it. She fully internalized the importance of the environment-dedicated competition. And she will be coming back this week with a new crown. Posted in: 1 Pageant Pages, 2 Shout-out-Looks. Tagged: Jamie Herrell, Miss Earth 2014, Miss Earth 2015. 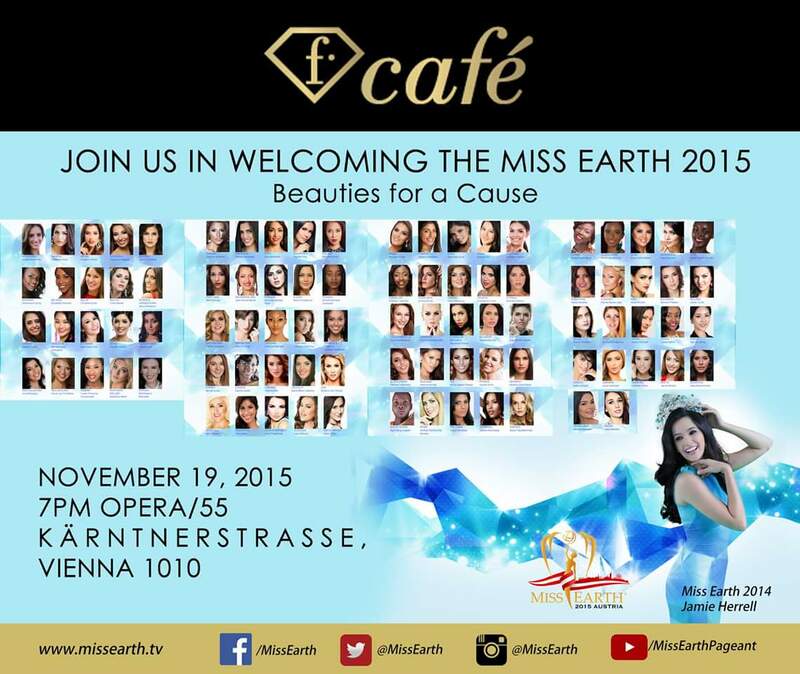 Tonight at Opera in Vienna, the competition for Miss Earth 2015 will officially start. Ninety-two (92) delegates are expected to complete the headcount for this year’s batch. And Fashion Café will be at the helm of the Welcome Event. This year’s edition promises to be the most enriching for both the contenders and the followers of the environment-themed beauty pageant. Given the scenic backdrop of the host city and its nearby locations, it will be pure joy to follow each day of the journey up until the culmination on December 5 when the next Miss Earth will be crowned. Being the reigning Miss Earth, 21 year-old Jamie Herrell has the task of acting as the big sister of the Miss Earth 2015 candidates in Vienna, Austria. This despite the fact that a whole lot of the current delegates are older than her. Jamie couldn’t be happier guiding the ladies on their respective journeys to the crown. She has had a fruitful reign, aside from being well-traveled all throughout. And in the next two weeks, she will be on the lookout for that one special girl who has what it takes to fill in her shoes. Posted in: 1 Pageant Pages, 2 Shout-out-Looks. Tagged: Carousel Productions, Jamie Herrell, Miss Earth 2014, Miss Earth 2015, UNIDO Headquarters. 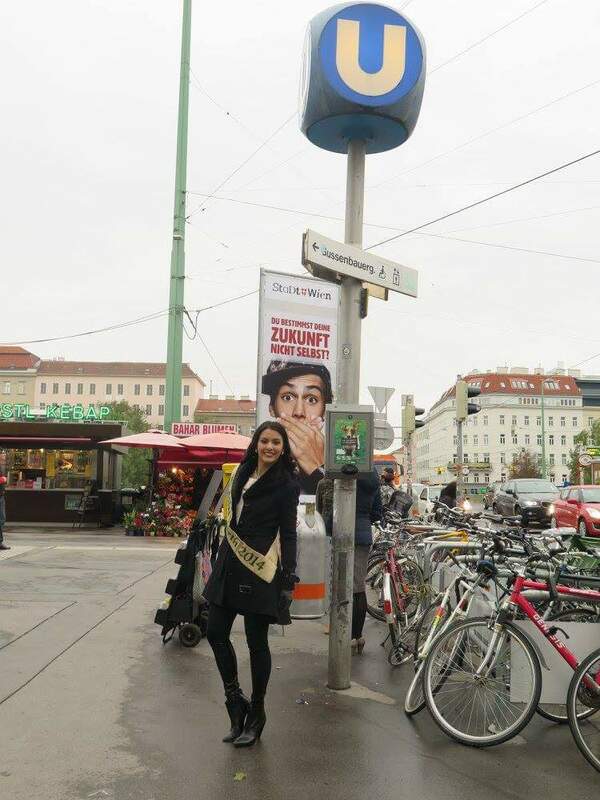 Miss Earth 2014 Jamie Herrell is indeed the travel bug these days. 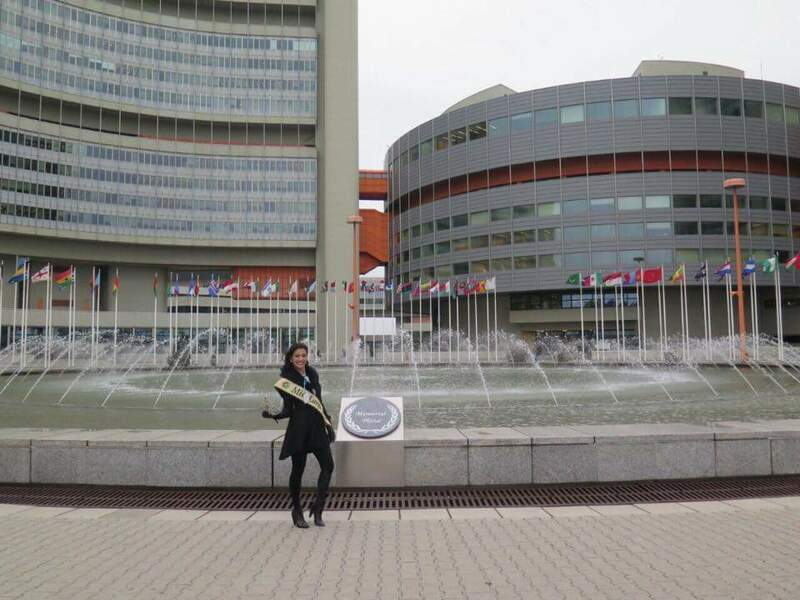 She just visited Vienna, Austria – host city of Miss Earth 2015 – where she went to the UNIDO Headquarters as well as filmed ft some promotional videos for the upcoming beauty competition in the Austrian capital. Along with Carousel Productions’ Lorraine Schuck, they were treated to all-around hospitality by the hosts. Jamie was also afforded the chance to tour the city and enjoy the sights and hospitality. She is definitely having the time of her life. This is the best year to be a reigning titleholder, given the first European gathering of all environmental beauty warriors. Posted in: 1 Pageant Pages, 2 Shout-out-Looks. Tagged: Jamie Herrell, Miss Earth 2014, Miss Earth Mexico 2015, Tulum. Just recently, Miss Earth 2014 Jamie Herrell traveled all the way to Tulum, Mexico as part of her tasks as the reigning titleholder. 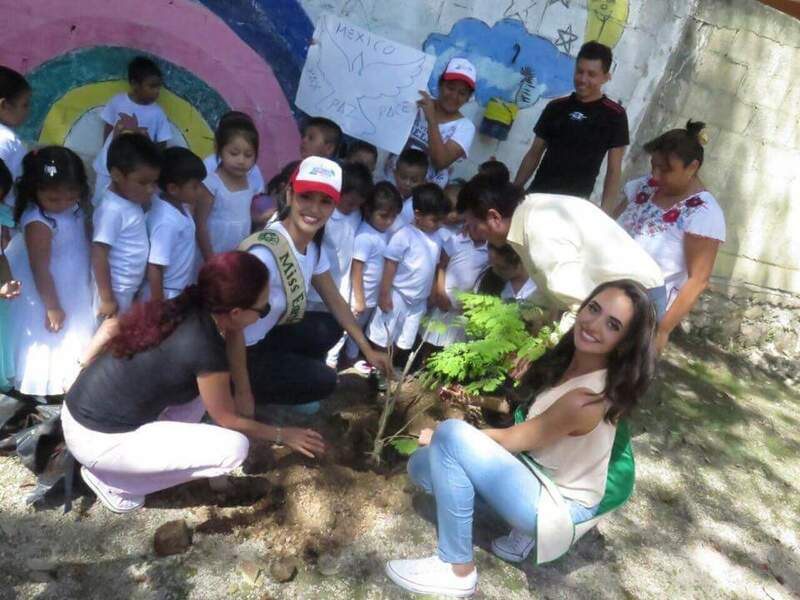 She went there as special guest of the Miss Earth Mexico Organization and to help crown the successor of Yareli Carrillo as the country’s next representative to Miss Earth 2015 happening in Vienna, Austria this coming December. While there, Jamie did the usual environmental activities with the Mexican hosts. 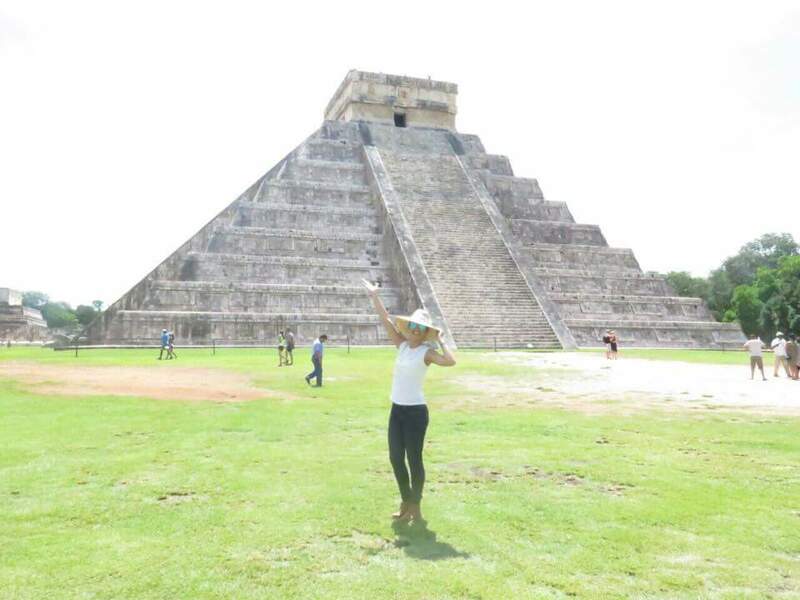 But soon after, she was given a grand tour of the place, including a visit to a Mayan Ruins site (left photo) where she had a fun day of photo ops and cultural appreciation. Posted in: 1 Pageant Pages, 2 Shout-out-Looks. Tagged: Jamie Herrell, Miss Earth 2014, Miss Earth 2015, Official Logo. 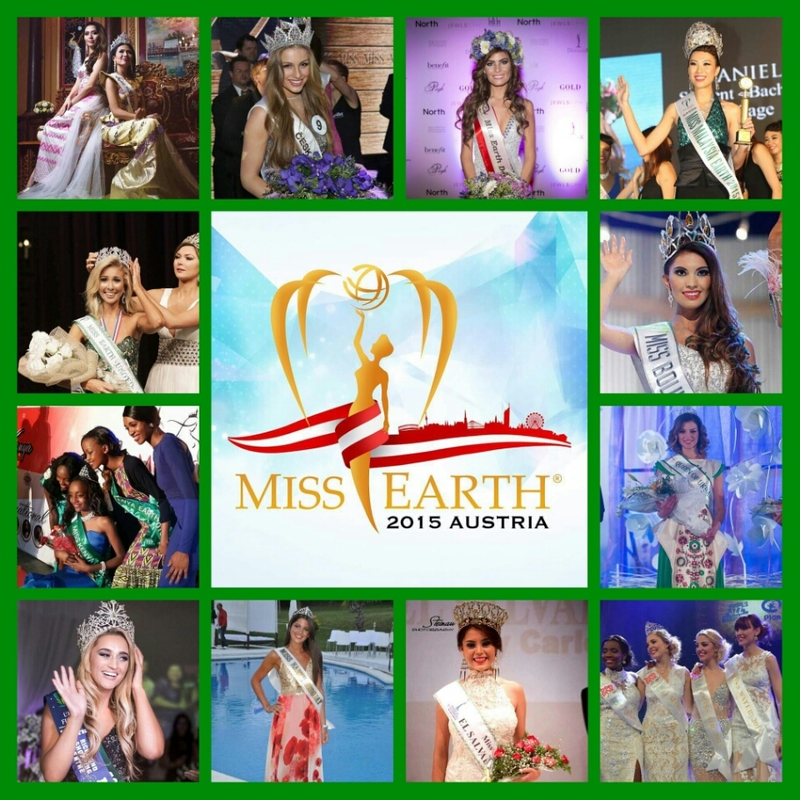 And so, the Official Logo of Miss Earth 2015 in Vienna, Austria makes it all real and genuinely forthcoming. Our homegrown international beauty pageant will indeed celebrate its Crystal (15th) Year in one of the most breathtakingly scenic European cities that will definitely make the candidates awe-inspired to give their best in the competition. Miss Earth 2014 Jamie Herrell will be flying to Vienna ahead of everyone else to film all her tourism-related pitches for the hosts, as well as show the best spots to be appreciated by the global audience during the finals. While there is still no confirmation on whether ABS-CBN will do a live via satellite airing late on December 5 (or early December 6), the production is anticipated to exceed all previous stagings of the same.